This feature is still experimental and disabled by default. For more information, see Experimental and preview features. Components are reusable building blocks for canvas apps so that app makers can create custom controls to use in an app or across apps. Advanced features, such as custom properties, enable complex capabilities in components. This article introduces component concepts and some examples. Components are useful in building larger apps that have similar control patterns. If you update a component definition, all instances in the app reflect your changes. You can also improve performance by using one or more components because you don't copy and paste controls, which duplicates overhead. Components also facilitates collaborative development and standardizes look-and-feel in an organization. Open the App Settings screen, select Advanced settings, and enable the feature, as well as ensuring that Improved app rendering is also enabled. 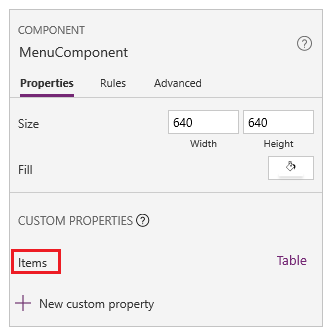 You can create a component from the Components menu on the Insert tab or, as the next graphic shows, in the left navigation bar. This list shows components that are defined in the app, sorted by creation time. Regardless of which approach you take, an empty canvas appears, where you can add controls as part of the component definition. If you edit a component in the canvas, you'll update instances of the same component in other app screens and other apps. 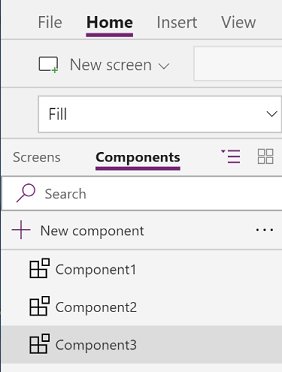 If you select a screen, you can select a component from the list of existing components in the left navigation bar or the Components menu on the Insert tab. When you select a component, you insert an instance of that component onto the screen, just as you insert a control. Think of a component as an encapsulated black box with properties as the interface. You can't access controls in the component from outside of the component, and you can't refer to anything outside of the component from inside the component. If you try, an error appears. Scope restrictions keep the data contract of a component simple and cohesive, and it helps enable seamless component-definition updates, especially across apps. You can update the data contract of the component by creating one or more custom properties. Components don't support the UpdateContext function, but you can create and update variables in a component by using the Set function. The scope of these variables is limited to the component, but you can access them from outside the component by leveraging custom output properties. If you export a component, you create a local file that you can import to a different app. If the app contains a modified version of the same component, you're prompted to decide whether to replace the modified version or cancel the import. As of this writing, you can't save components to the cloud or share them within an environment. A component can receive input values and emit data if you create one or more custom properties. These scenarios are advanced and require you to understand formulas and binding contracts. An input property is how a component receives data to be used in the component. Input properties appear in the Properties tab of the right-hand pane if an instance of the component is selected. You can configure input properties with expressions or formulas, just as you configure standard properties in other controls. Other controls have input properties, such as the Default property of a Text input control. Output properties can emit data or component state. For example, the Selected property on a Gallery control is an output property. When you create an output property, you can determine what other controls can refer to the component state. This walkthrough further explains these concepts. In PowerApps Studio, create a blank app. 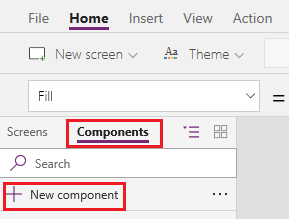 In the left navigation bar, open the list of components, and then select New component. While hovering over the new component, select the ellipsis (...), select Rename, and then type or paste MenuComponent. 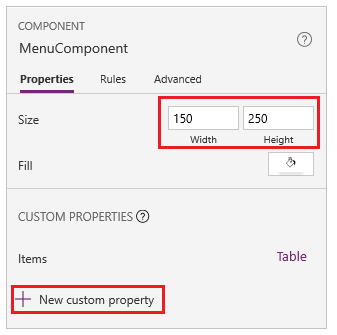 In the right-hand pane, set the component's width to 150 and its height to 250, and then select New custom property. 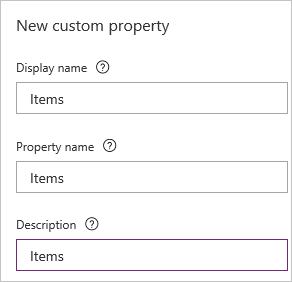 In the Display name, Property name, and Description boxes, type or paste Items. When you specify a property name, don't include spaces because you'll refer to the component by this name when you write a formula (for example, ComponentName.PropertyName). The display name appears on the Properties tab of the right-hand pane if you select the component. A descriptive display name helps you and other makers understand the purpose of this property. The Description appears in a tooltip if you hover over the display name of this property in the Properties tab. In the Data type list, select Table, and then select Create. 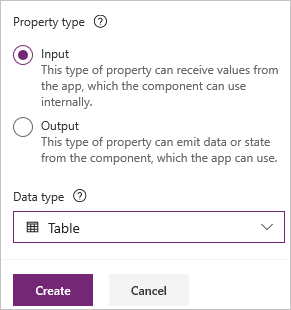 The Items property is set to a default value based on the data type that you specified, but you can set it to a value that suits your needs. If you specified a data type of Table or Record, you may want to change the value of the Items property to match the data schema that you want to input to the component. In this case, you'll change it to a list of strings. You can set the property's value in the formula bar if you select the name of the property on the Properties tab of the right-hand pane. As the next graphic shows, you can also edit the property's value on the Advanced tab of the right-hand pane. In the component, insert a blank vertical Gallery control. This way, the Items property of the Gallery control reads and depends on the Items input property of the component. Set the Gallery control's BorderThickness property to 1 and its TemplateSize property to 50. In the template of the Gallery control, add a Label control. Next, you'll add the component to a screen and specify a table of strings for the component to show. In the left navigation bar, select the list of screens, and then select the default screen. 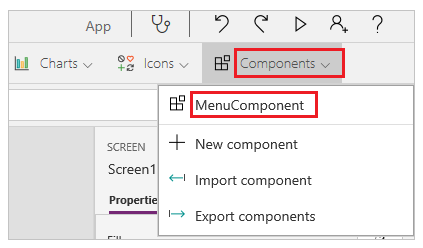 On the Insert tab, open the Components menu, and then select MenuComponent. The new component is named MenuComponent_1 by default. This instance resembles this graphic, but you can customize the text and other properties of each instance. So far, you've created a component and added it to an app. Next, you'll create an output property that reflects the item that the user selects in the menu. 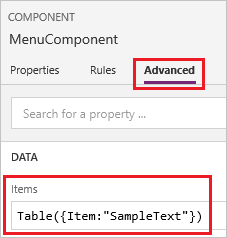 Open the list of components, and then select MenuComponent. In the right-hand pane, select the Properties tab, and then select New custom property. In the Display name, Property name, and Description boxes, type or paste Selected. Under Property type, select Output, and then select Create. Note that MenuComponent_1 is the default name of an instance, not the name of the component definition. You can rename any instance. While holding down the Alt key, select each item in the menu. The Label control reflects the menu item that you selected most recently. As of this writing, data sources aren't saved with components, so forms and data tables are disabled. If you create a variable in a component, that variable is scoped only to that component and doesn't appear with app variables. 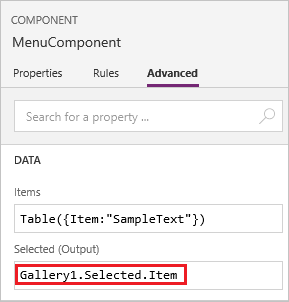 PowerApps doesn't support collections in components. You can't insert a component into a gallery, a form, or a data card. A master instance of a component is a local master and scoped to the app. If you change a master instance, only copies of the component within the app will reflect the change. Copies in other apps will remain the same unless you import the component library again. All master instances in those apps will be automatically detected and updated. You can't package media files when you import a component.